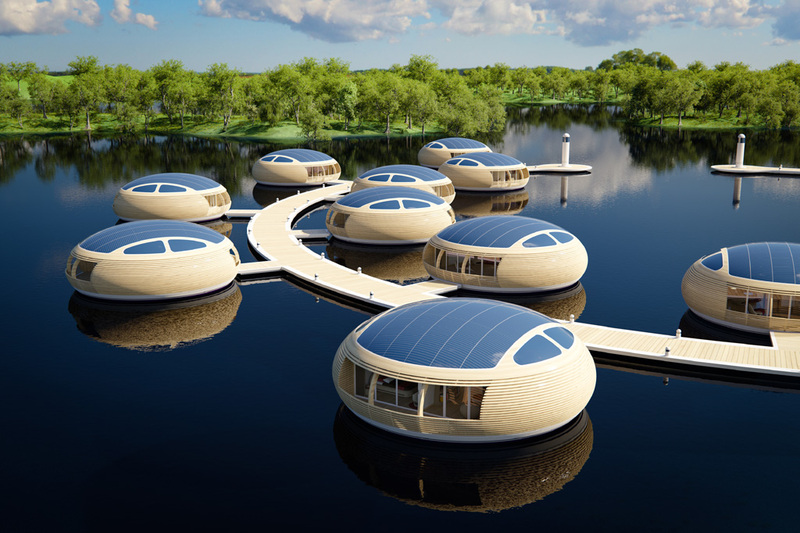 WATERNEST VILLAGE | Several habitats WaterNest 100 can be installed with a radial or linear configuration on lakes, bays, atolls and sea areas with calm waters to create an eco-resort with floating villages. 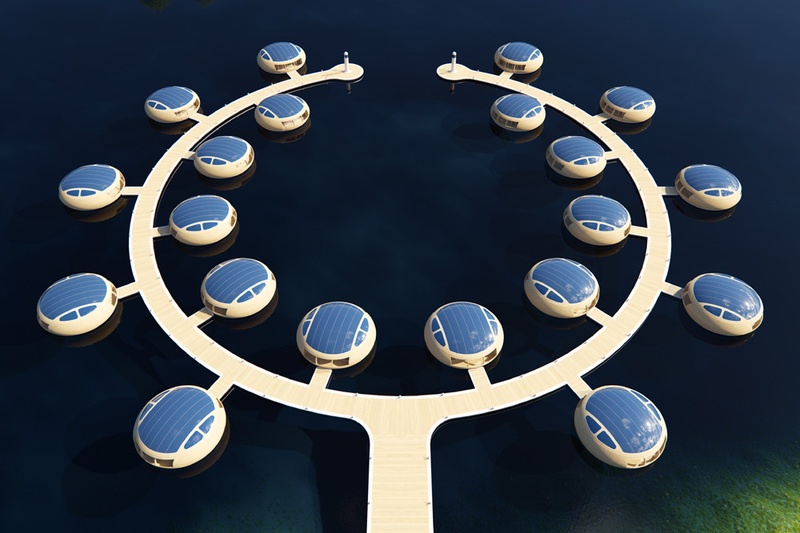 Both the floating docks and habitat are made from natural materials and environmentally friendly production systems that make this floating architecture up to 98% recyclable. Each home has a sophisticated natural internal micro-ventilation and air conditioning system configured for low-energy consumption in residential housing. Each WaterNest has 60 square meters of amorphous photo-voltaic panels that generate 4kW of daily power, making WaterNest Village a real solar power generator that produces all the electricity needed for day and night operation of the entire floating village. 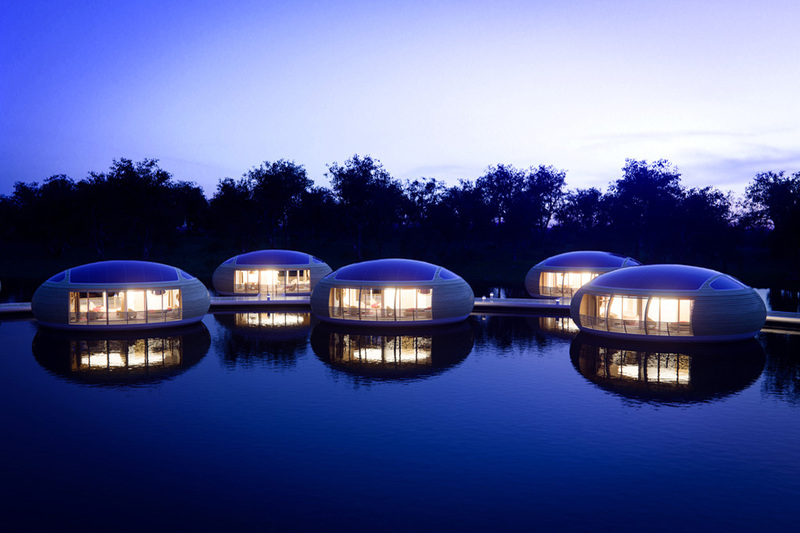 Fluctuations in water level are no problem for the WaterNest Village which adapts in a natural way by raising or lowering its floating level without the use of mechanical elements or any waste of electricity. The interior of each of 100 square meter WaterNest habitat is characterized by being warm and welcoming, with a contemporary style full of innovative. The wooden aromas of the structure fill the living space. The large windows allow light to enter and illuminate the interior environments all day long. The high-design furniture are made of eco-friendly natural recyclable material – the result of rigorous selection of the best known and established companies in contemporary ecological design which meet the highest stylistic demands. WaterNest Village designed by the renown Italian architect Giancarlo Zema is the ideal solution for hotel groups and hospitality investors working in the field of eco-tourism who wish to make a truly innovative floating resort and environmentally friendly way to live in style independently, exclusively and in complete harmony with nature.